Reversible Destiny traces the history of the Sicilian mafia to its nineteenth-century roots and examines its late twentieth-century involvement in urban real estate and construction as well as drugs. 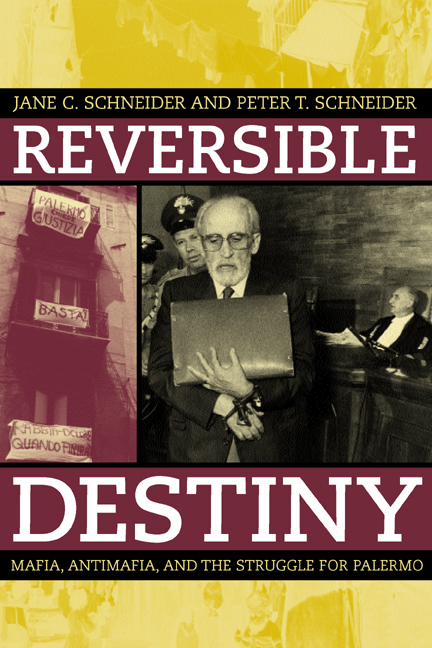 Based on research in the regional capital of Palermo, this book suggests lessons regarding secretive organized crime: its capacity to reproduce a subculture of violence through time, its acquisition of a dense connective web of political and financial protectors during the Cold War era, and the sad reality that repressing it easily risks harming vulnerable people and communities. Charting the efforts of both the judiciary and a citizen's social movement to reverse the mafia's economic, political, and cultural power, the authors establish a framework for understanding both the difficulties and the accomplishments of Sicily's multifaceted antimafia efforts. Jane C. Schneider is Professor of Anthropology at the Graduate Center, City University of New York. Peter T. Schneider is Professor of Sociology at Fordham University. They are the authors of Festival of the Poor: Fertility Decline and the Ideology of Class in Sicily, 1860-1980 (1996) and Culture and Political Economy in Western Sicily (1976).